Whereas Lesser Celandines are members of the Buttercup family, the Greater Celandine is in fact a relative of the various poppies. Usually 30 to 90cm tall but occasionally well over a metre in height, this sparsely-hairy plant is characterised by greyish-green pinnate leaves with lobed margins. The branching stems are topped with loose cymes of typically three to five yellow flowers, 15 to 25mm across, with four oval petals. This perennial wildflower is fairly common throughout Britain and Ireland and can also be found in many parts of mainland Europe and Asia. 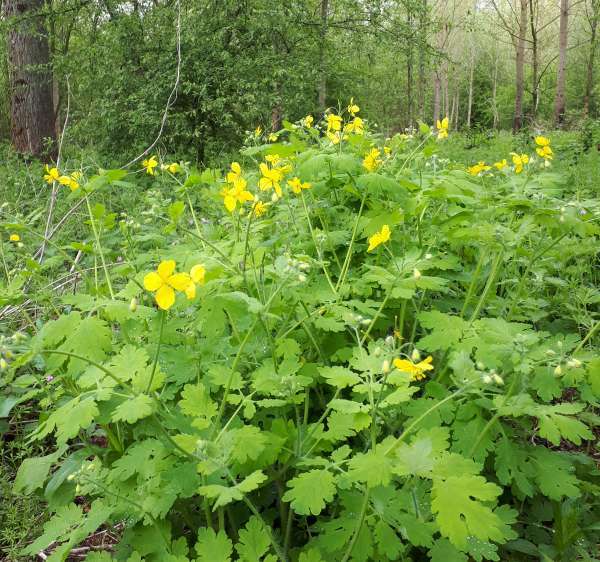 Greater Celandine was introduced and is now quite widely distributed in North America. 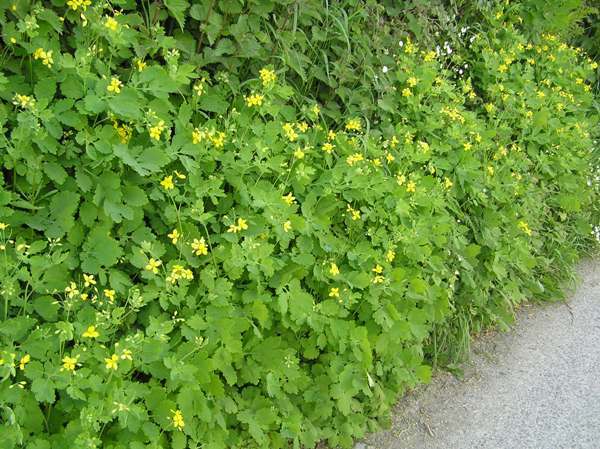 Chelidonium majus is most often seen in urban hedgerows, beside woodland paths, and on sheltered tree-lined riverbanks, but occasionally this plant occurs on disturbed scrubby waste ground too. In Britain and Ireland the first flowers of Greater Celandine appear in April, but it is usually June or even July before these lanky plants make much of a show; they continue blooming until at least the middle of October. The orange sap within this plant contains toxins which, in appropriate amounts, may have medicinal value - and in the past this plant was used as the basis for many herbal remedies including the treatment of toothache. We strongly advise against eating or using as medicines any plants without first obtaining qualified professional advice. Chelidonium means swallow (the bird) and may be a reference to coincidence of appearance of the first flowers of Greater Celandine flowers and the arrival of Swallows in Northern Europe, in late spring. (Their departures, in October, also coincide.) 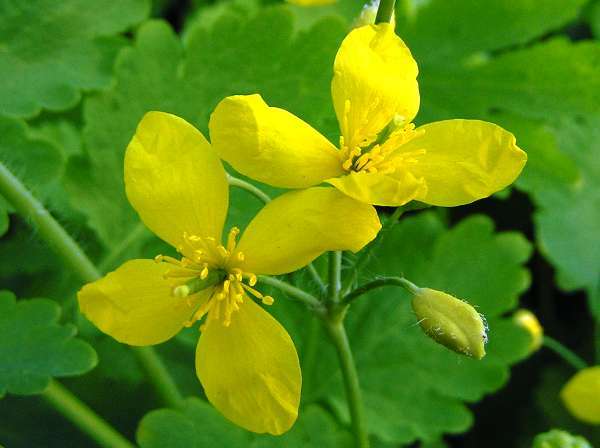 The specific epithet majus is Latin and translates to 'Larger', and of the two flowers known as Celandines this is certainly the taller. Chelidonium majus is not only the type species of the Chelidonium genus but the only species in that genus - the genus is therefore termed monotypic. Greater Celandine is unlikely to be confused with any other yellow members of the Poppy family, all of which are far more 'showy'.